The Pole Mountain area of the Medicine Bow National Forest has varied and interesting features that are well worth exploring. From incredible rocks to incredible wildlife, this is a place worth visiting. Vedauwoo is supposed to be an Arapaho word that means “earth born” and is used to denote the fascinating rock formations and outcrops that occur in the southwest corner of the Pole Mountain area.The formations of Sherman granite rise without a prelude from the prairies and forests and leave visitors scratching their heads at the how some of the rock are balanced. It is well known for its rock climbing although the ratings can be stiff and the cracks unforgiving. All of these critters inhabit and migrate through the area with the change of seasons. In my opinion the most dangerous animal to encounter would probably be the moose. They are big, they are protective, and they don’t like to share the road. I have personally observed them trotting down the middle of a dirt road for 15 minutes in front of a vehicle. Their black coat also makes them extremely difficult to see at night. Unfortunately vandalism and reckless use are far too common in the Pole Mountain Area. The old military bunkers are covered in graffiti and there are multiple places where ATV’s have created deep ruts and unsightly areas. Poachers, careless recreational shooters, and some ATV users, detract from the area’s usage and natural beauty. Please leave the area better than when you found it and clean up after yourself. This will do much to preserve these treasures for the next visitor. 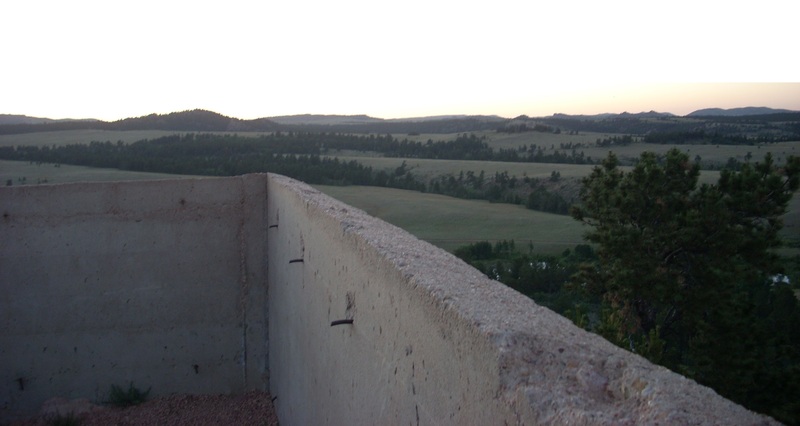 View from on top of an abandoned bunker. While some people may think of the Pole Mountain area of the Medicine Bow National Forest as just a place to recreate and enjoy the outdoors it has a rich and varied history. To this day there are signs warning that it was once a target and maneuver area for the United State’s Military and one should be careful of unexploded ordnance (explosives). I have personally traveled much of this area and there is much to explore and discover. The area was inhabited by Native American tribes for many centuries who according to legend gathered here to make medicine and bows, hence the name, Medicine Bow. Then came the railroads who used the lumber for railroad ties and telegraph pole, and gave it the name “Pole Mountain“. According to the Wyoming Military Historic Context, 1920-1989 pg.242 report, different parts of the forest came under Federal control over the years first as a timber reservation, then a military training area and finally in 1961 came under the complete control of the U.S. Forest service. There are two concrete bunkers, old foundations and abandoned rifle pits. I have been to both bunkers and they are in fairly good condition although sadly covered by graffiti. There is a large rock with a pipe cemented to the top of a rock that is said to have been used to run airplane silhouettes down to the ground on a cable to train anti-aircraft gunners. I got this particular story third hand but have personally seen the pipe, remnants of the cable and ladder. A gentleman by the name of Roger Ludwig has done an excellent job of cataloging some of these old sites and their locations. There have been at least two movies filmed at the Pole Mountain area, incidentally both used members of the military for extras. The first was the “Charge of the Light Brigade” which depicted the famous charge of British cavalry in the Crimean War. It was produced in 1912 and used 800 troopers of the U.S. cavalry for extras. The second is “The Plainsman” which was produced in 1937 and starred Gary Cooper and Jean Arthur. Members of the Wyoming National Guard were used for extras in the cavalry scenes. My next post will deal with more of the unique features of this place.